UNIVERSITY OF VIRGINIA ‘1515’ IS A PILLAR FOR SAFE AND INCLUSIVE STUDENT SOCIAL SPACE COMPLETED BY NALLS ARCHITECTURE, INC.
ARDMORE, PA – June 21, 2017 Nalls Architecture, Inc. is pleased to announce that it has completed the University of Virginia ‘1515’ project which had its official Grand Opening on Friday, March 17th, 2017. 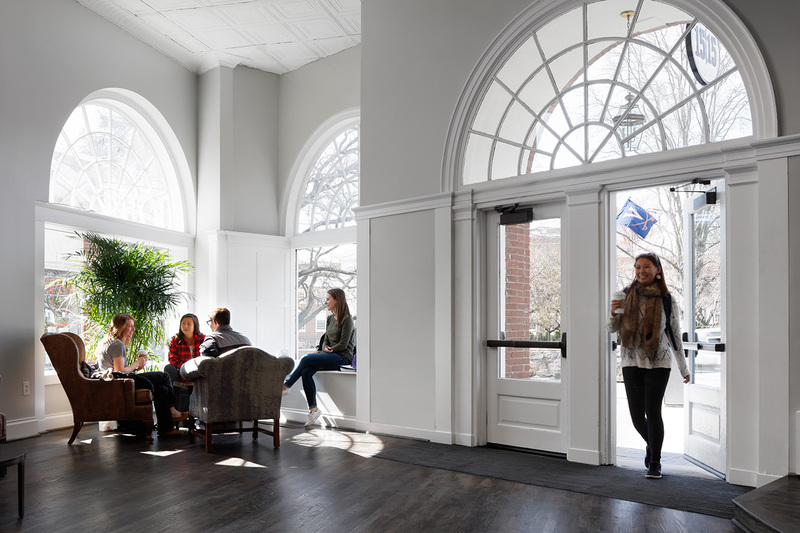 The former 15,000 gsf Student Book Store – a registered historical building which has seen many lives on the Corner – was revitalized into a student activity space. The University administration took a leap of faith while promoting student self-governance in empowering a select group of student leaders to develop competing concepts that formed the foundational vision for the project. The students were adamant about creating a “non-institutional” environment, but also understanding of the limitations of budget and needs of the building. The student steering committee was integral from the schematic design and planning phases all the way through design development and finish selection. By polling the greater student body, they took it upon themselves to strive to make sound decisions for the betterment of all UVa students, present and future. With limited “fun” spaces on grounds, Nalls Architecture accepted the challenge to convert the structurally-compromised historic building into a multi-faceted, student-oriented space that provides the vibrancy and attraction of commercial environments while affording the University space to offer support to its students. It was decided that some of the historical character of the former boarding house would be maintained by identifying the different spaces as ‘rooms in a house’, such as Dining Room, Sun Room, Studio, Garage, etc. ‘1515’ has three floors which offers students a place to rehearse, study, play and relax. Career Services is available during the day, the main floor hosts ‘Crumbs on the Corner’, a late night coffee and dessert cafe. Everything from meeting spaces, to arcade games to entertainment is available at 1515 for all UVa students. The student center is a pillar for safe and all-inclusive social space while serving as a safe haven for students. It was designed as a landing space to touch-down and recharge in the midst of their busy days.